Zion Market Research has published a new report titled “Stearic Acid Market for Lubricants, Personal Care, Fuel Additives, Rubber Processing, Soaps & Detergents and Other Applications: Global Industry Perspective, Comprehensive Analysis, and Forecast, 2016 – 2022”. 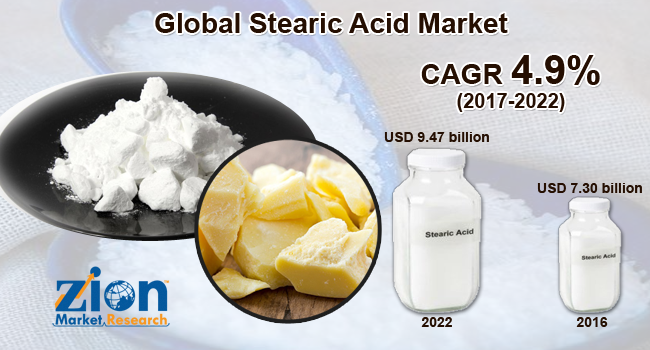 According to the report, the global stearic acid market was valued at USD 7.30 billion in 2016 and is expected to reach USD 9.47 billion by 2022, growing at a CAGR of 4.9% between 2017 and 2022. Stearic acid is a saturated fatty acid. It is derived from fats containing carbon and methyl chains. It has solid wax structure and can be available in form of ester and salts. It can be naturally found in animals and vegetable fats and also derived chemically through saponification method. It is also known as octadecanoic acid. It is extensively used as additives in food industries and also utilized in various sectors such as cosmetics, pharmaceuticals, chemicals, adhesives, lubricants, paints, and coatings, etc. The global stearic acid market is primarily driven by growing demand for intermediates and additives applications in numerous industries across the globe. Moreover, changing trends and growing developments in food and personal care industry is likely to fuel the growth of the stearic acid market in the near future. Rising demand for stearic acid in an automobile is also another driving factor that is expected to boom the market size during the next few years. However, fluctuating prices of raw material may slow down the growth of the market. Nonetheless, emerging market in developing countries is likely to set new wings to the global stearic acid market during the years to come. Lubricants, personal care, fuel additives, rubber processing, soaps & detergents are the major applications of the global stearic acid market. Soaps & detergents led the global stearic acid market in 2016. It held more than 26% share of the total market of stearic acid in 2016 and this trend is predicted to continue over the next few years. Moreover, personal care industry is predicted to experience the fastest growth of the market within the forecast period. Additionally, rubber processing is likely to exhibit a strong growth in the coming years. Comparatively, lubricants and fuel additives are projected to witness the moderate growth over the coming years. The Asia Pacific was the most attractive market for stearic acid in 2016. Furthermore, it is anticipated to continue its dominance over the global stearic acid market within the forecast period. On-going research and development coupled with growing automotive industry in the region are likely to grow the market size at a strong CAGR during the future years in the Asia Pacific. Additionally, Asia Pacific was followed by North America and Europe in the same year. Latin America and Middle East & Africa are expected to witness the lucrative growth of the market owing to the emerging food and automotive industries in these regions during the estimated years. The major players of the global stearic acid include Wilmar international, U.S chemical company, BASF, Kao Chemicals, P&G, Oleon, AkzoNobel, Godrej, PT.Cisadane Raya Chemicals, Acme Synthetic Chemicals, Protea Chemicals, Nimir Industrial Chemicals Limited, and VVF LLC among others.